A fun rhyming story loaded with construction vehicles! All of our favorite trucks are back on the construction site—this time with a focus on team-building, friendship, and working together to make a big task seem small! Down in the big construction site, the crew faces their biggest job yet, and will need the help of new construction friends to get it done. Working as a team, there's nothing they can't do! 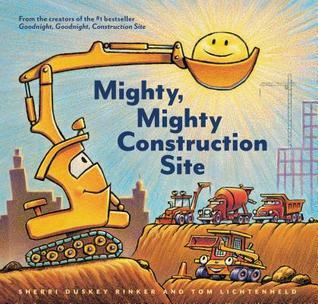 Mighty, Mighty, Construction Site was written by Sherri Dusky Rinker and illustrated by Tom Litchenheld. It was published in 2017 by Chronicle Books. five trucks wake to the morning light. and gear up for the day ahead! This story is a great one to study if you’re working on a rhyming text. The rhyme and rhythm keeps the story moving and there is a story that doesn’t bend to fit the rhyme scheme. I really liked the action-filled and detailed illustrations! A great story for a read aloud with younger kids. It would be fun to pair this up with Susanna Leonard Hill’s THE ROAD THAT TRUCKS BUILT (see my review here). Students could compare and contrast the events and vehicles working in the two stories. Discuss: What is your favorite construction vehicle in the story? What is it’s job? Encourage students to design their own buildings using classroom materials. Draw a plan for your building. How many blocks will you need? Try to build it—or have a friend build it. How tall is your building? How could you measure it?